One of the world's richest men and most active philanthropists, Bill Gates, surprised many when he brandished a jar of human waste at a forum on the future of the toilet in Beijing. "In places without sanitation you have got way more than that," Mr Gates said, pointing to the faeces inside the clear canister resting on a table. "When you think of things that are basic right up there with health and enough to eat, you think that having a reasonable toilet certainly belongs on that list," Mr Gates said. He has previously used shock tactics to draw attention to his disease-battling efforts. In 2009, he released mosquitoes at a Technology, Entertainment, Design (TED) Conference in California to make a point about the deadly sting of malaria - waiting a minute or so before assuring the audience the liberated insects were disease-free. 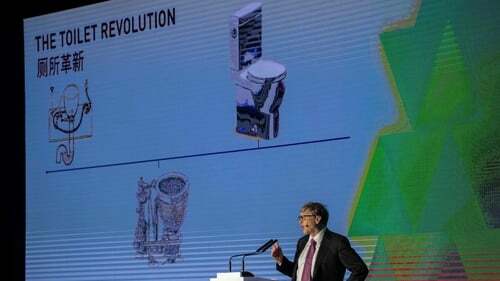 Mr Gates was in Beijing for the "Reinvented Toilet Expo", a forum hosted by the Bill & Melinda Gates Foundation showcasing various cutting edge toilet technology in lieu of sewers, making them easier and cheaper to install the devices. The world's second largest economy is in the midst of a drive to improve its bathrooms, a campaign President Xi Jinping has dubbed the "toilet revolution". China has made great progress in improving health and sanitation for millions of people, Mr Gates said.